The Nine Innings crew dishes on the future of starting relief pitchers, Javier Báez's inability to walk and Brandon Crawford's underappreciated brilliance. The Milwaukee Brewers are a legit postseason contender and the St. Louis Cardinals are assembling a shutdown rotation, so the Chicago Cubs don’t have the margin of error they had last year, when nobody else in the division finished more than five games over .500. What’s wrong? The Cubs don’t win one-run games (5-9), they don’t hit with runners in scoring position (.228), they strike out with a runner on third and less than two outs more than anybody else (31) and they don’t steal many bases (18). But none of that matters significantly. The Cubs are just fine offensively, and bound to get better at getting runners home from scoring position. Here’s what is wrong with Chicago: Yu Darvish, Jose Quintana and Tyler Chatwood. Three of their starters induce sweaty palms every time they take the mound. Full stop. Nothing else matters like the failure of these three starters. Darvish, Quintana and Chatwood have started 28 of Chicago’s 50 games. Together they average 5.0 innings per start, 5.9 walks per nine innings and a 4.60 ERA. They are the reason why the Cubs have the highest walk percentage in the National League. Ever hear of a team that walks more batters than anybody else in the league getting to the postseason, nevermind making a run? Neither have I. 1. Darvish. He felt irritation in his triceps during his last side session, so the Cubs put him on the DL (triceps tendinitis). They are running some tests, and hope to have him back pitching this weekend against the Mets. Maybe this was just Darvish’s arm letting him know he was fatigued and needed a break. Maybe it’s a warning light of a bigger problem. We just don’t know yet. We do know that Darvish is doing less with quality stuff than almost any elite pitcher this side of Sonny Gray. His stuff grades out well, but how he uses it and how quickly he falls apart when a bit of adversity strikes has been alarming. Nobody in the league with seven starts is worse third time around lineups than is Darvish (1.405 OPS). What to do? I’d start with ditching that stretch delivery he uses all the time, even with nobody on base. Not only is there no deception, his habit of changing his grip as he slowly puts the ball in his glove makes him vulnerable to tipping pitches, which is what happened against Houston in the World Series last year. 2. Quintana. He is your fourth worst pitcher when the lineup turns over a third time (1.185). His walk rate and strike percentages are career worsts. He has just four quality starts, none of them back-to-back. In 24 starts since joining the Cubs last year, Quintana has pitched to a 4.14 ERA, making him the rare veteran pitcher who declined appreciably after trading the AL (3.51) for the NL. Quintana throws his four-seam fastball way too much (48%, more than any other pitch). It’s a below-average fastball by every metric you can think of: velocity (91.1), spin rate (2,029 rmp) and batting average allowed (.299). Only Chad Bettis of the Rockies has less spin on his fastball than does Quintana. In addition, Quintana has an easy delivery to time with no deception and no tilt in his shoulders to create life and leverage on the ball. The four-seamer just isn’t good enough to beat people, especially when Quintana falls behind in the count. Hitters are batting .414 and slugging .793 when Quintana throws it behind in the count—which happens way too much. What to do? Quintana needs to throw more sinkers than four-seamers and he needs to throw his curveball more on fastball counts. Quintana throws 71% fastballs on first pitches (hitters are hitting .440 on his first pitches) and 80% on full counts (with a .465 OBP). 3. Chatwood. This seems to be a classic case of a pitcher struggling under more attention and expectations. Signed as a free agent after six rather non-descript years with the Angels and Rockies (40-46), Chatwood has reacted poorly to the spotlight. He simply can’t find the plate. It’s painful to watch. He’s throwing almost 50% balls with both his four-seamer and sinker. Overall, he’s throwing just 54% strikes and hitters are taking 62% of the pitches he throws. He’s always been a below-average strike-thrower, but this is truly ugly. It doesn’t help that Chatwood throws with unorthodox and even poor mechanics: he has a too-quick tap of the ball in his glove as he delivers, he hooks the ball with his wrist on the takeaway, and he doesn’t get the ball raised into the loaded position at front foot strike. What to do? If Darvish makes it make this week, Chatwood may have to switch places with Mike Montgomery, who left the bullpen for a start Monday and pitched well. The Reds are toast. They’re toast-er than toast; they’re Jim Nantz-level toast. Only the Orioles, chasing the transcendent Red Sox, sit further out of first place than does 19-36 Cincinnati. Nothing at the macro level has gone well for the Reds. After a 3-15 start compelled them to dismiss manager Bryan Price, they have yet to really rebound. Every starter here is struggling—reclamation project Matt Harvey is the only rotation member with an ERA under 4.76—and the outfielders are, too. Cincinnati’s outfield has been the NL’s second-worst by wins above replacement. And yet toiling away on the riverfront, untroubled by his team’s woes, is a left-handed-hitting infielder who is putting forth yet another great season to little fanfare. I’m talking, naturally, about second baseman Scooter Gennett. (Did you think I had someone else in mind? Joey Votto is scuffling.) Gennett had a whale of a week, with a grand slam in the Reds’ 7-2 win on Tuesday and a 5-for-5-with-a-homer-and-a-nifty-game-ending-defensive-play Saturday in the Reds’ 6-5 win in Colorado. In Cincy’s losses on Sunday and Monday he nevertheless went a combined 5-for-9 with a double. He had already been named NL Player of the Week a couple weeks back; his more recent torrid pace has kept him among the league’s elite for May. MLB’s OPS leaders since April ended, as Jayson Stark noted on Monday: Mike Trout, Mookie Betts, and Gennett. Gennett has hit .409/.430/.750 this month, which is easy enough to write off as a fluke, except that he posted a strong March/April line of .298/.344/.412 on the heels of a career year in 2017. In fact, Gennett has an .892 OPS since the beginning of last season, which ranks him fourth among middle infielders in that span, behind only Daniel Murphy, Jose Altuve, and Carlos Correa. Gennett’s four-homer game last July, which was figured then as a bizarre occurrence, was in actuality a sign of the player he had become. What’s his secret in becoming a new player late in his 20s? He’s come a long way from his slap-hitting days in Milwaukee. But no one improvement in particular jumps out. Despite his meager walk totals, he’s improved his strike zone judgment, swinging at fewer pitches outside the zone, and more pitches in the zone. (He used to struggle to lay off the low-and-away pitch, especially from righties. He’s seeing it better now.) He’s taken part in the flyball revolution, too, with an average launch angle that has climbed every year he’s been in the big leagues. More pressingly: Now that Gennett is valuable, what are the Reds supposed to do with him? At 28, with free agency upon him after next season, the Reds could very well decide that Gennett is unlikely to have any value by the time the team is next contending. The Angels, Indians and Dodgers could make good use of him. But then again the Reds may reckon that trading away the only good story on their misbegotten team would be nihilistic. Whatever happens, though, they’ll just keep on losing, and Scooter Gennett will keep on hitting. WHY IS VLAD GUERRERO JR. STILL IN THE MINORS? 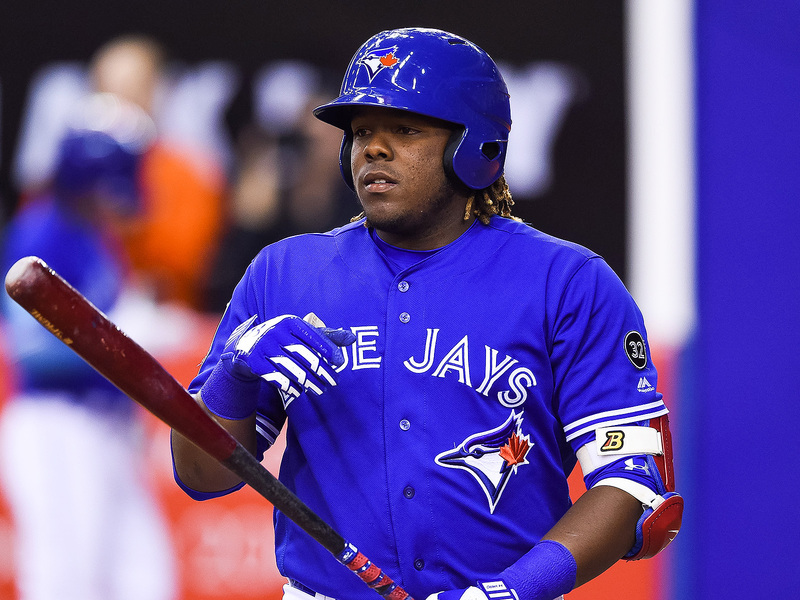 At a certain point, what more does Blue Jays super-prospect Vladimir Guerrero Jr. have to do to earn a promotion? Hitting .433 at the age of 19 in his first taste of Double A hasn’t moved his parent team to put him on the first plane to Toronto. Nor has hitting .479 in the month of May, or driving in 50 runs in 46 games, or piling up 26 multi-hit games in the first two months of the season. By just about any measure, Guerrero has solved the Eastern League, if not outright destroyed it. Yet every new day features him suiting up for the New Hampshire Fisher Cats instead of taking his hacks in the majors, or even at Triple A. Why? To be fair, there’s no real point in sending Guerrero to Buffalo to torture International League hurlers. As a level, Triple A is more of a holding place for veterans and fringe big leaguers than a finishing school for legitimate prospects. Double A is the home for true blue-chippers, and if this is what Vlad Jr. is capable of against the top pitching prospects in the game, then what will facing a league full of soft-tossers far past their expiration date tell the Blue Jays about his readiness? The only test left is the big leagues, and yet the Blue Jays won’t let Guerrero take it. In some respects, that’s understandable. Despite torching opposing pitchers day in and day out, Vlad Jr. remains a teenager with just 200 plate appearances above Class A. He’s as advanced a hitting prospect as exists, yet the jump to the big leagues is massive. There’s also the matter of his glove at third base, which is currently average at best. “Needs to work on his defense” is a common excuse for keeping a top prospect in the minors instead of bringing him up, but in this case, Guerrero could use all the chances he can get there—and with Josh Donaldson ensconced at the hot corner in Toronto (although he exited Monday's game with left calf tightness), those opportunities won’t be present in the majors. Toronto needs the help, too. After falling to the Red Sox on Memorial Day, the Jays have lost seven of their last 10 and are now 9–17 in May. An early hot start has given way to a sub-.500 record and a double-digit deficit in the AL East. The wild-card picture—Toronto is 8 ½ games out of the second spot and behind three teams in that race—isn’t much prettier. Every game going forward, then, counts massively if the Jays want to get back into contention, and adding a bat as good as Guerrero’s could help make the difference. That’s particularly the case given how little Toronto has gotten from its designated hitters this season, primarily from declining veteran Kendrys Morales: a collective .661 OPS, second worst in the AL, from the former, and a putrid .179/.256/.313 line with just four homers and a 54 OPS+ from the latter. There’s almost no way Vlad Jr. couldn’t improve on those numbers if given the chance. So why is Vlad still in New Hampshire? Money likely plays a large part. The longer he stays down in the minors, the more service time the Blue Jays will control—and, if he’s there past the Super Two arbitration cutoff, which is sometime in the next week or two, the cheaper it will be as well. Putting future paychecks ahead of present contributions seems shortsighted, if financials are involved in the decision, but that’s nothing new. Just ask Kris Bryant and Ronald Acuña Jr., both held back by their respective clubs—despite being obviously ready for prime time—for economic reasons. Whether it’s defense or dollars keeping Guerrero in Double A, though, MLB fans are left feeling like Samuel Beckett’s Vladimir as they wait for Toronto’s. And with every massive home run or three-hit night, the delay in Vlad Jr.’s arrival gets tougher and tougher to understand, much less tolerate. So do the right thing, Jays: Give us Vlad. ROUNDTABLE: SHOULD TEAMS FOLLOW IN THE RAYS' FOOTSTEPS AND START RELIEVERS ON OCCASION? Emma Baccelieri: The Rays were well-positioned to try this strategy for a few reasons—chief among them, that they aren't trying to contend this year and don't have many inspiring options on their pitching staff to begin with. Those terms apply to quite a few teams right now, though, and it shouldn't be terribly surprising to see one of them give this a try before the year is out. (The Mets have already discussed it.) Even in the dream scenario here, when the reliever in question has extreme splits and the top of the opposing lineup is heavily slanted in his favor, there likely isn't a huge benefit to be gained. But when a team has nothing to play for and a lackluster rotation in need of a boost, there isn't much to lose. Gabriel Baumgaertner: The Reds are going to be the next team to do this. Amir Garrett and Jared Hughes are potential shutdown relievers with starter potential and Cincinnati has a host of forgettable starters (Homer Bailey and Sal Romano might not be viable starters on any other big league franchise), but has some promising arms in the pen. It wouldn’t be a terrible idea for them to try out the Rays’ strategy. Michael Beller: I guess so? Rarely does one team try something revolutionary and not see a few acolytes follow in its footsteps. Still, I’m not quite ready to call the Rays’ brain trust of manager Kevin Cash, GM Erik Neander and pitching coach Kyle Snyder a new-age Sons of Liberty. As much as the game has changed, and as coldly logical as using a reliever to throw one or two innings at the start of a game might seem, starting pitchers are an immutable part of baseball’s DNA. Plus, it’s not like the Rays are out there asking Max Scherzer or Chris Sale to enter a game in the second or third instead of the first. Hell, they wouldn’t even consider doing it with Chris Archer. It’s certainly an interesting experiment, and it might have some merits depending on a team’s roster composition, but I don’t think it’s going to sweep the league. Jack Dickey: For all the talk about the recent hacking of baseball—and essentially all of that has been true—it’s worth noting that certain fundamentals of the game have proven fairly stubborn. The closer-centric bullpen. The general idea of three outfielders and four infielders. Overhand pitching. The notion that for pitchers, strikeouts are preferable to outs on balls put into play. And of course the idea of the starting pitcher. It’s possible that the game clings to these attitudes because big-league franchises are hidebound and steeped in old-timey mythology. But it’s also possible that the game clings to these attitudes, and others like them, because they make sense. Who knows? I’m all in favor of any sort of experimentation with these concepts, and while I’d prefer it to happen at the minor-league level rather than in MLB, the 2018 Rays are more or less a minor-league outfit anyway, albeit a .500 one. I’m not sure that too many teams past or present match the Rays’ void of starting pitching, and I have a hard time imagining why a team with plenty of pitching would go with the Rays’ approach. Then again, fewer and fewer teams these days have what would qualify as plenty of pitching. So I say again: Who knows? If the starting pitcher becomes a thing of the past, I will miss it dearly, just as I miss the 250-inning workhorse of yore. But baseball will survive. Connor Grossman: I find this to be a more entertaining idea than most, but the clear caveat is that you won't see a contending team starting a reliever anytime soon. As others have noted, this strategy is suited for teams that lack a sturdy rotation but supply a rotating cast of replacement-level relievers. It works for cash-strapped teams without much on the line. The Yankees won't be starting Aroldis Chapman anytime soon. Craig Kimbrel won't make any first-inning cameos at Fenway. Conceptually, I like the idea. But the ceiling on it appears to be very low, for now. Jon Tayler: MLB is a copycat league, and just as every team endeavored to build its own super-bullpen after the Royals rode one to two pennants and a World Series title, I expect some will explore using relievers at the beginning of games given the Rays’ success doing so. There are plenty of reasons to follow Tampa’s lead, too. The statistics and strategy support it, if you have the right personnel and are facing the right lineup. The financials do, too: Relievers cost less than starters, and that’s particularly the case if, like the Rays, your bullpen is mostly interchangeable minor leaguers on cheap deals and with options to burn. The Starter isn’t a viable strategy for everyone. Opposing teams can adjust to it easily, and using a good reliever in the first inning instead of in a potential crucial late-game situation doesn’t feel like the best use of a player. But in an era where every other relief arm throws 97 mph with a wipeout slider while starters aren’t allowed to go through a lineup three times or throw more than 100 pitches, it’s no surprise that we’ve ended up here. Relievers have never been better or more valuable, so it makes sense to explore all possible deployment options. Tom Verducci: The Rays’ “opener” gambit is not the future of baseball. 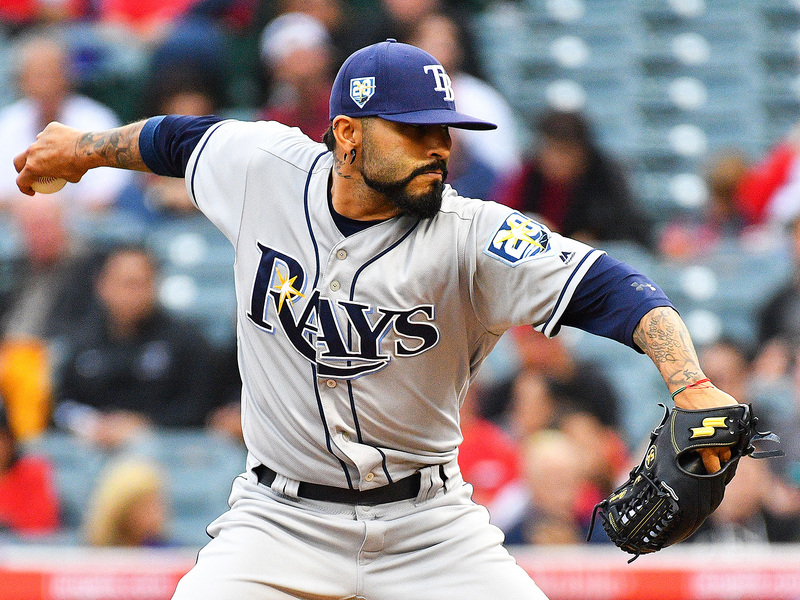 It makes sense when an organization hasn’t developed enough true starting pitchers and especially when it is facing a manager (Mike Scioscia) who doesn’t adjust his all-righthanded top of the lineup when he knows a righthanded slider specialist (Sergio Romo) is starting the game. It’s a niche product, and one I’m not buying. I get why the Rays are doing this, and it gives them a better chance to win some games, which is all they should worry about. But for me? It’s a lousy product. Years ago I wrote about how the kudzu-like growth of relief pitching is choking baseball as a fan-friendly entertainment option. The Rays are hastening that decline, just as they did with the magic of “pitch framing” (remember when they went all in on Rene Rivera?) and three true outcomes (when they featured the most boring team in baseball last year with an emphasis on too many players who don’t put the ball in play. They were next to last in the league in runs). One way to sell a game is what’s been exclusive to baseball for more than a century: the probable pitchers, the one position in sports published exclusively in advance of two teams meeting. And the fewer innings starting pitchers throw, the fewer wins they get, and the fewer wins they get, the fewer marquee names baseball has to promote its games. An update to what I wrote earlier this year about the death of the pitcher’s duel: we still have not seen a game this year in which both starting pitchers lasted eight innings. It hasn’t happened since September of last year–that’s more than a thousand games without seeing two starters go at it deep into a game. So, no, this is not a trend and nor is it anything for which you should root. Want something better on your wish list? Hope that MLB limits the number of pitchers on an active roster to 12. Now if you’re anything like me, you’re probably wondering just how good his splitter is. Is it really untouchable? OK, looks pretty untouchable. But is it really what makes him truly great? Alright, the point is clear: the splitter is an elite weapon. The numbers, of course, bear this out. Ohtani has racked up a 29.7% whiff rate with the splitter. It’s been responsible for strike three on 30 of his 52 strikeouts, and hitters are 1-for-14 against it when putting it in play. That’s just about as realistically dominant as a pitch can be. You know what number stands out to me in that paragraph, though? It’s the one hit. That’s right, as filthy as Othani’s splitter is, one hitter managed to “solve” it. That might be overstating it, but one hitter managed to make solid contact against Ohtani’s splitter and find the outfield grass. On May 5, Wilson Ramos lined an 0-1 delivery into leftfield for a clean single. It’s the most unlikely hit of the 2018 season. It came in the top of the seventh, as the Angels led the Rays, 3-1. 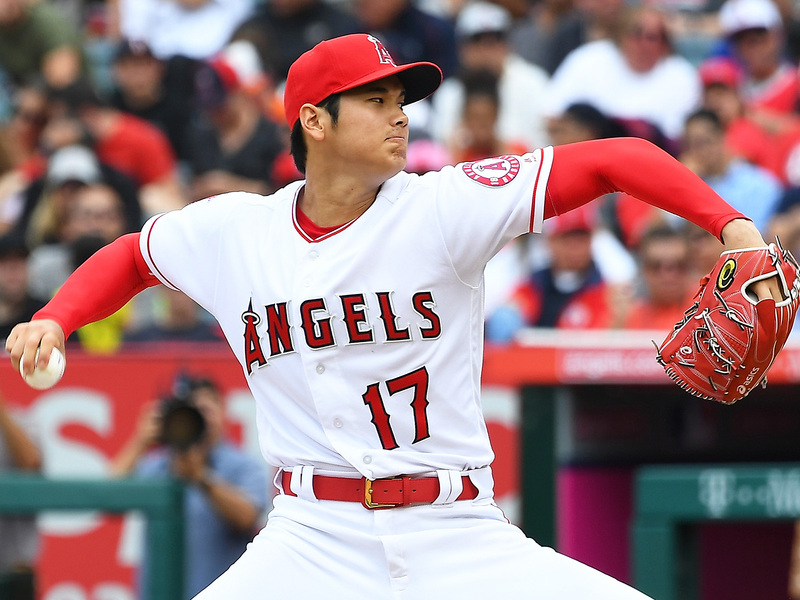 Ohtani had allowed one run on two hits with eight strikeouts, six of which came on the splitter. Ramos led off the inning, having flown out and grounded out in his first two plate appearances. He fouled off a 97-mph fastball on the first pitch of the at-bat. Then, this happened. Watch this replay, and look how close Zack Cozart came to catching this thing. Cozart was this close to keeping Ohtani’s splitter perfect on the season, and if he timed his jump a little better hitters would likely be 0-for-44 against the pitch, including the 30 strikeouts. Still, a hit is a hit, and even Ohtani can’t get away with a splitter that high in the zone. For a brief moment in the Anaheim sun, then, Wilson Ramos was the king of baseball. He figured out the game’s most impossible riddle, the answer to which seems to be, “Hope and pray that Ohtani screws it up.” It doesn’t happen very often. 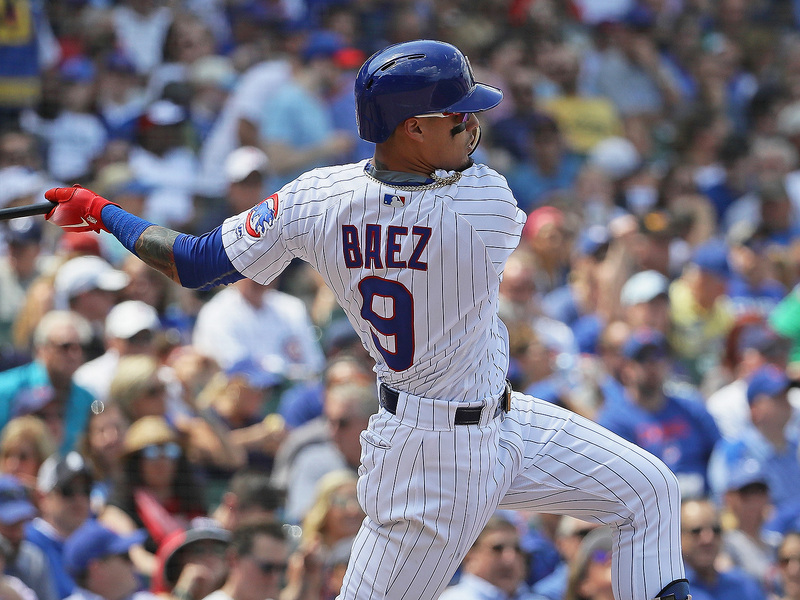 Javier Báez is having the best offensive season of his career so far—entering Monday with an OPS+ of 127, thanks in large part to 13 home runs and a .574 slugging percentage that mark a notable upgrade over his previous personal best of .480. In all that success, though, there’s one area that hasn’t improved: his plate discipline. That’s never been one of Báez’s strengths, of course, but the weak spot there has been particularly glaring lately. On Monday, his walkless streak reached 37 games, the longest such stretch of his career and the longest by any player this season. Báez has been swinging more than anyone else—he’s the only player to swing at more than 60% of pitches this season—and that’s been especially true when it comes to pitches outside the zone. There, he’s swung nearly half the time, well above the major-league average of 30%. This all makes for just a slightly more extreme version of the hitter Báez has always been; his 3% walk rate this year isn’t much lower than his career mark of 4.8%. But that’s still enough to make the question of how, exactly, anyone does walk Javier Báez in 2018 feel like a valid one. Of the six walks he racked up before his current no-free-pass streak, four were intentional. The other two came during the same series, an early April trip to Milwaukee. First, he benefited from Jacob Barnes losing his command, and two days later, from Zach Davies getting distracted with runners on (also relevant: a pitchout made up one of the four balls there). It’s almost more instructive here to look at some of the times that Báez hasn’t walked, rather than those he has—when he’s gotten to a three-ball count and then struck out. April 13th, second inning, facing Aníbal Sánchez: This looks like it should have been easy—four pitches clearly outside the strike zone, by a pretty notable margin, and a bonus one on the border. Yet Báez couldn’t lay off the second high fastball there, and so he struck out swinging. April 29th, first inning, facing Zach Davies: This is the only one of these three at-bats that includes a called strike. But even on an occasion when Báez may have thought he was doing well to set himself up for a walk, by laying off the pitch right on the outside corner there, the umpire thought otherwise. So when Báez saw a similar pitch later in the at-bat, he swung—and whiffed, which sent him back to the dugout. May 15th, eighth inning, facing Dan Winkler: With the pitches that Báez swung on circled in red, this chart shows an at-bat that should have been nearly impossible to strike out on. But Báez managed it anyway. Most (or, uh, least) impressive of all is that he did it by falling for three similar pitches in a row, and they was ones that he had no business falling for. Even when pitchers have invited him to walk, Báez has rarely made the journey to first base. Regardless, his approach clearly works. And for those wondering—the record for games without a walk by a position player was set by backup first baseman Bob Hale, who went 191 games without a free pass from 1957 to 1961. Báez won’t get there, but that doesn’t mean he won’t try. 1. I think the Brewers are a legitimate contender in the NL Central race. They made two of the smartest acquisitions of the offseason in signing Lorenzo Cain and trading for Christian Yelich and now they’re 15 games over .500 and 4 1/2 games ahead of the second-place Cubs. The biggest asset for them? The bullpen. Tom Verducci detailed Craig Counsell’s innovative bullpen use in a prior Nine Innings, and he’s created one of the most fearsome units in the big leagues. The wavy-haired Josh Hader is the star of the show—sporting a a 17.8 K/9 rate, a 1.15 ERA and surrendering just eight hits over his 18 appearances. And then there is Jeremy Jeffress, whose ERA sits at 0.32 (one earned run in 24 innings) over 27 games. Matt Albers, another one of Milwaukee’s strong offseason signings, rocks a 1.17 ERA over 20 appearances. Craig Counsell might be the best bullpen manager in the big leagues, and the Brewers are a good shot to win any game if they enter the sixth inning with a lead (which helps offset their otherwise underwhelming starting rotation). 2. I think the Cardinals need to acquire a bat before the trading deadline passes. 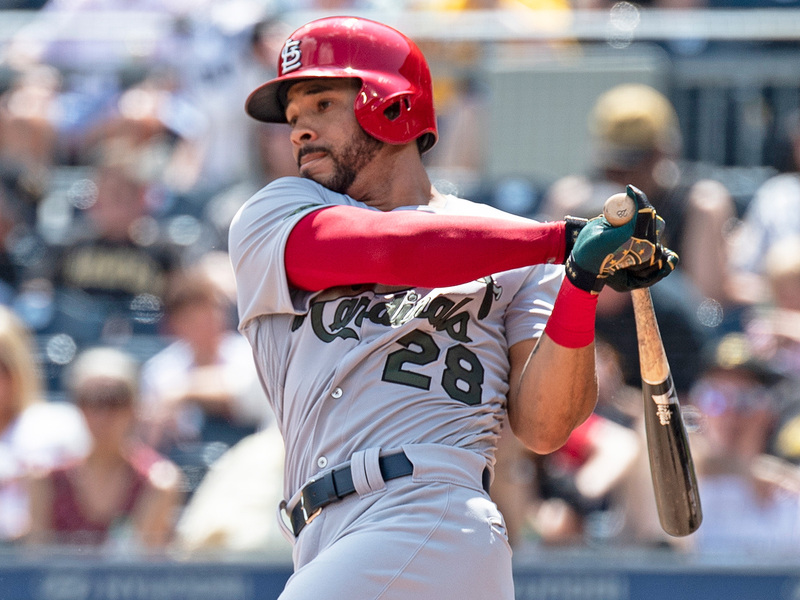 St. Louis has gotten nothing out of Dexter Fowler (.157/.276/.288) over 181 plate appearances, Kolten Wong (.177/.270/.290) and a 55 OPS+, and, most disappointingly, Marcell Ozuna (three homers in 202 plate appearances). Matt Carpenter has a .328 OBP to make up for his paltry .214 average, but he’s another cog in a disappointing offense. They’ll remain a threat as long as they receive their fantastic starting pitching (with Alex Reyes returning from injury this week), but the offense must improve. 3. The Cubs’ starting pitching has been a disappointment, as Verducci noted above. New acquisitions Tyler Chatwood and Yu Darvish have combined for a 4.49 ERA and a 1.4 K/BB rate. Darvish is now on the DL and Chatwood has a 5.95 ERA (with 23 walks and 17 strikeouts) in May. After being eliminated in the NLCS, Chicago sought strong rotation reinforcements to make up for the departure of Jake Arrieta. It hasn’t worked. 4. The Pirates are fading, but they’re pretty fun. Starling Marte’s star faded after his PED suspension last year, but he’s hitting .305/.361/.509 with eight homers even after spending time on the disabled list. Rookie outfielder Austin Meadows is off to a piping hot start (15-for-33, three homers) and Richard Rodriguez is the best reliever you’ve never seen. 5. Scooter Gennett might be Roberto Clemente in a Reds uniform. The guy is hitting .340/.376/.558 with ten homers in 212 plate appearances. He has higher wRC+ than Nolan Arenado, Bryce Harper and Francisco Lindor. The launch angle revolution has birthed the career revolutions of Justin Turner, Chris Taylor and Josh Donaldson … but Gennett might be the best example of what a swing change can do. The Nine Innings crew discussed underappreciated players last week, and Giants shortstop Brandon Crawford stands as one of many omissions. The situation above is perhaps the most reactionary scenario any shortstop could find itself in. Crawford plays along like he read the script days ago, bare-handing the deflection off Evan Longoria’s glove and rocketing a throw to first. This play illustrates his two greatest assets: superhuman hand-eye coordination and brilliant arm strength. What’s more? He’s hitting over .400 this month and stands as an obvious Player of the Month candidate. Crawford is one of baseball’s most enjoyable players to watch. If at any point you find yourself questioning instant replay's place in baseball, just remind yourself of Armando Galaragga. Remind yourself of Jim Joyce. Remind yourself that Galaragga tossed a perfect game, and then with a wave of Joyce's arms, signaling "safe" on what should have been the game-ending groundout, baseball changed forever. This Saturday marks the eight-year anniversary of Galaragga's Imperfect Game. While it remains a black eye on the sport, especially in the age of instant replay when these types of plays are overturned in a flash, it's important to remember the sportsmanship displayed in the aftermath of this mess. Tom Verducci chronicled the emotional, bizarre and unforgettable journeys of Joyce and Galaragga after the game that changed both of their lives forever. The headline, "A Different Kind of Perfect," encapsulates the narrative perfectly. Enjoy the excerpt below and find the full piece here. Bigger than the call, however, were the unscripted responses of Joyce, 54, and Galarraga, 28, to their chance meeting. It was the epitome of the human element—not so much for the mistake that was made as for the subsequent humility and grace of the two men. Galarraga, despite having a place in history suddenly ripped from his grasp, gave Joyce no word of protest. Instead, as many of his teammates held their heads in shock and shouted at Joyce, Galarraga looked at the umpire with a wry smile of disbelief. It stayed on his face for several moments, as the righthander turned and headed back to the mound. "I was so excited, he couldn't ruin my happiness," says Galarraga. "I just started laughing. That included nervousness. With the nerves coming out, I just laughed." "His smile is burned into my memory," Joyce told SI three days later. "I am absolutely enthralled with the way Armando has handled this."